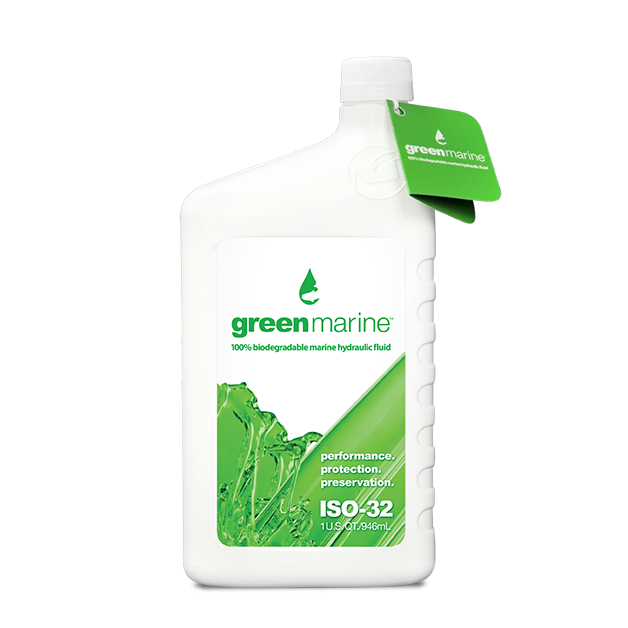 Green Marine ISO 32 hydraulic fluid is a non-toxic, biodegradable, high performance, environmentally responsible alternative to conventional hydraulic fluid. This hydraulic fluid was specifically designed to perform in rugged marine systems, both freshwater and saltwater, that demand anti-ware, anti-rust, anti-oxidation and demulsibility. In the event of a leak or spill, Green Marine provides complete biodegradation in 28 days causing no harmful effect to marine life. Green Marine: – Exceeds synthetic performance levels – Improves thermal sheer stability – Increases load capacity – Conserves Energy Green Marine is the preferred hydraulic fluid for all Power-Pole hydraulic anchor systems. Using Green Marine in your hydraulic marine systems can extend the life of your equipment and the marine life where you fish. Green Marine ISO 32 is 100% compatible with traditional hydraulic fluids. Green Marine ISO 32 is designed for use in Power‐Pole® systems, trim tabs, jack plates, hatch lifters, inboard/outboard tilt & trim and more. For new systems just add the proper amount of Green Marine specified by the manufacturer. For existing systems – drain old petroleum‐based fluid, purge components, and then add the proper amount of Green Marine according to manufacturer’s guidelines. Cycle several times. Your system will be about 95% green at this time. Repeat the draining, purging and refilling process to achieve a 99.9% green system. Dispose of old fluid in a responsible and legal manner – recycle if possible.